Paying fitting tribute to the Kuki bravehearts who went down fighting for their rights and freedom, a centenary commemoration of Anglo-Kuki War (1917-19) was held at Tuibong Village, about 60 km south of Imphal in Manipur’s Churachandpur district on Wednesday. Manipur’s Health and Family Welfare Minister L Jayentakumar Singh attended the historic event in which the who’s who of Kukis in the region participated besides the village chiefs. Speaking on the occasion and saluting the immense sacrifice made by Kuki leaders in the past, Minister Jayentakumar who was once posted as judicial magistrate in the area before joining politics said that today is one of the most important days, not only for the Kukis but for all the people. He said, “People pay obeisance to our forefathers who sacrificed their lives fighting for our cause. It is high time to unite and bury our differences. We should try to materialise our forefathers’ spirit of unity.” Several dignitaries spoke on the occasion. 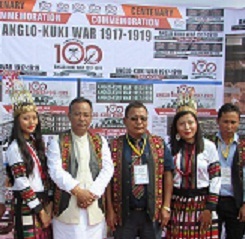 President PS Haokip of Kuki National Organisation (KNO), in a written speech which was made available to the media during the day’s event, said that they commemorated the anniversary of the Anglo-Kuki War, a war that their forefathers fought to preserve the integrity of the ancestral lands in the hills of present-day Manipur. The commemoration date for the Anglo-Kuki War, or Kuki uprising (1917-1919) was chosen on October 17 as on this fateful day in 1917, Lonpi Village in present-day Chandel district of Manipur was burnt down, Haokip informed. “With people uniting and meaningful dialogue happening, very soon political settlement will follow which will establish the much-needed political security for the Kuki people and peaceful co-existence with time immemorial neighbours,” he added. It may be mentioned that currently the Kuki armed groups operating in Manipur including KNO, which is an umbrella body of some groups, signed suspension of operations involving the Centre and the State Government since 2008 to pave way for dialogue which commenced in 2016.